South African born Bernie Langton, is a self-taught artist now living in Michigan USA, who loves life, loves to laugh and loves love! She has developed her own personal style of art which is very inspiring. “Practice makes perfect” they say, and this is so true in her case because she just gets better and better. 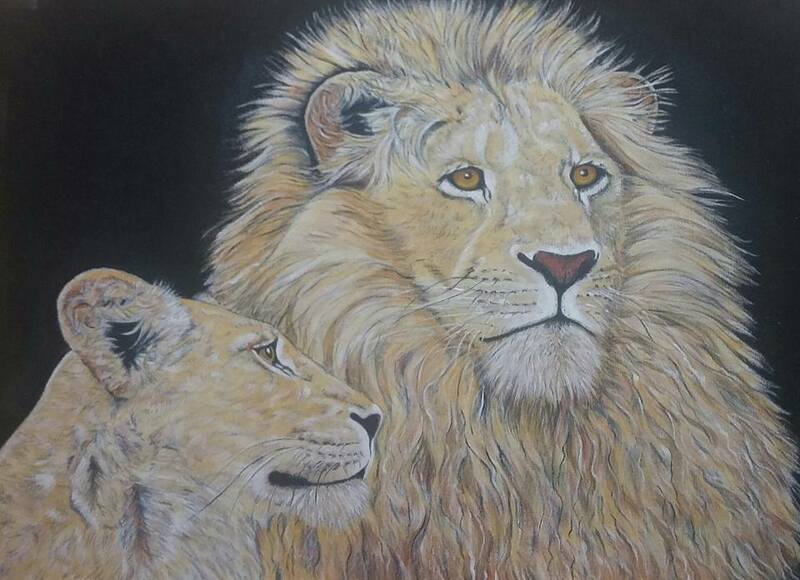 Bernie enjoys doing wall murals; drawing; and painting animals and portraits using acrylics, pencil, oil paint and various other drawing tools – often mixing styles to demonstrate the desired effect. Looking at her work, one gets the feeling that whilst Bernie loves what she does, she may be one of many artists who sit up at night kicking themselves for not aggressively pursuing their passion earlier. I’m certain that her time breeding racehorses and going head to head with other leaders in the construction field must have been challenging, exciting and fulfilling, but only now is she devoting all her time and energies into her passion and really honing her talent. down-to-earth, delightful and lovely to look at. This tremendous artist has completed portraits of Marvin Gaye, Bob Marley and Tata Mandela just to name a few… and after many years she finally did one of herself; thankfully she didn’t cut her ear off first! LOL. In 2009 Bernie was part of a project with East Rand Hospital, painting wall murals for the children’s ward; giving back to the community has always been close to her heart. I read an old newspaper clipping in which she was awarded high praise for donating firewood to the less fortunate; its selfless acts like these which make one love her not just as an artist but as a person! Its wonderful to see that her skills and talent haven’t made her forget whats truly important, like staying humble and helping others. Thank you for reading this blog post! I hope you enjoyed looking at Bernie’s pictures. You can see and purchase Bernie’s drawings and paintings here, and contact her for any commissioned work as well. Connect with BluSilva to let us know who are your favourite artists, and read our blog for more informative articles, as well as freebies and advice. Check here to see the services we offer.